I am the founder of Mental Health Advocates United and Advocates for People with Mental Illnesses. Yesterday, I challenged both my group and followers of my page to thank a mental health advocate. As the day continued, the idea developed into the Thank an Advocate Challenge. 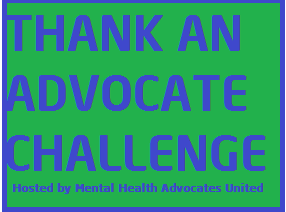 I have taken the challenge on myself and have thanked several advocates including ones I know personally, politicians, musicians, FB page and Twitter page owners that have accounts that deal with mental illnesses. Please take a few moments to thank at least one other advocate. Make sure you let them know that it is part of the this challenge by simply using the hashtag #thankanadvocatechallenge. In addition, help spread the word about this challenge. Let’s encourage each other. 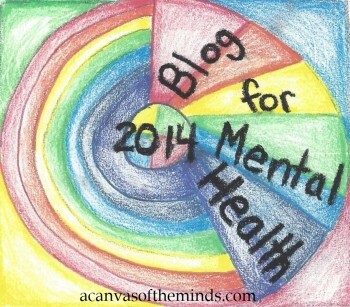 By doing so, we will be helping and encouraging other advocates, but also those who have a mental illness. As mental health advocates, it is important that we encourage other advocates to continue fighting the fight. The discrimination and stigma that come with mental illness is only going to change through education and awareness. Advocates, working together, can show that there is hope and recovery when you have a mental illness. 1. Contact someone you know who is a mental health advocate and thank them for what they are doing. 3.We need to encourage those who are advocating for us. 4. It would be helpful if you let others know the contact information of who you have contacted in case they want to thank the same person. 5. Share this with your fellow advocates and on your page to spread the word. This entry was posted in Uncategorized and tagged #thankanadvocatechallenge, ADDHD, advocates for people with mental illness, alcoholism, bipolar disorder, borderline personality disorder, BringChange2Mind, Demi Lovato, deprsesion, keith o'neil, mental health, mental health advocate, Mental Health Advocates United, mental illness, nami, OCD, PTSD, schizophrenia, thanking advocates. Bookmark the permalink.